2 Kings 19:9 and Isaiah 37:9 mention a Tirhakah, king of Ethiopia (Kush), who the Bible says waged war against Sennacherib during the reign of King Hezekiah of Judah. Some scholars have identified him as the pharaoh Taharqa. The events in the biblical account are believed to have taken place in 701 BC, whereas Taharqa came to the throne some ten years later. A number of explanations have been proposed: one being that the title of king in the Biblical text refers to his future royal title, when at the time of this account he was likely only a military commander. Necho II is most likely the pharaoh mentioned in several books of the Bible. Jeremiah 44:30 mentions his successor Apries or Hophra (589–570 BC). 1 Kings 11:40 and 2 Chronicles 12:2 sqq. tell of an invasion of Israel by Shishak, and a subsequent raid of Jerusalem and the Temple of Solomon. He is generally identified with Shoshenq I (943–922 BC). 2 Kings 17:4 says that king Hoshea sent letters to "So, King of Egypt". No pharaoh of this name is known for the time of Hoshea (about 730 BC), during which Egypt had three dynasties ruling contemporaneously: 22nd at Tanis, 23rd at Leontopolis, and 24th at Sais. Nevertheless, this ruler is commonly identified with Osorkon IV (730–715 BC) who ruled from Tanis, though it is possible that the biblical writer has mistaken the king with his city and equated So with Sais, at this time ruled by Tefnakht. The passages Genesis 12:10–20 narrate how Abraham moves to Egypt to escape a period of famine in Canaan. The unnamed pharaoh, through his princes, hears of the beauty of Abraham's wife Sarah who is summoned to meet him. Because of her, Abraham rises in the Pharaoh's favor and acquires livestock and servants. After discovering Sarah's true relationship to Abraham (as a result of plagues sent by Yahweh), the pharaoh chooses not to take her as his own wife. He releases her and Abraham and orders them to take their goods and to leave Egypt. 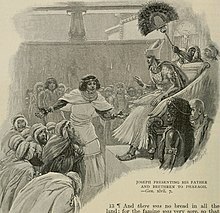 The last chapters of the book of Genesis (Genesis 37–50) tell how Joseph, son of Jacob/Israel, is first sold by his brothers into Egyptian slavery but is promoted by the unnamed pharaoh to vizier of Egypt and is given permission to bring his father, his brothers, and their families into Egypt to live in the Land of Goshen (eastern Nile Delta around modern Faqus). Dedumose II (died c. 1690 BC): David Rohl's 1995 A Test of Time revised Egyptian history by shortening the Third Intermediate Period of Egypt by almost 300 years. As a by-result the synchronisms with the biblical narrative have changed, making the Second Intermediate Period king Dedumose II the pharaoh of the Exodus. Rohl's theory has failed to find support among scholars in his field. 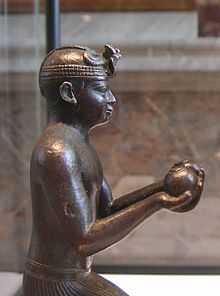 Ahmose I (1550–1525 BC): Most ancient writers considered Ahmose I to be the pharaoh of the Exodus. Akhenaten (1353–1349 BC). Sigmund Freud in his book Moses and Monotheism argued that Moses had been an Atenist priest forced to leave Egypt with his followers after Akhenaten's death. Ramesses II (c. 1279–1213 BC): Also known as Ramesses the Great, he is the most commonly imagined figure in popular culture (most widely via the 1956 film The Ten Commandments), being one of the most long standing rulers at the height of Egyptian power, but, as with all other Pharaohs, there is no documentary or archaeological evidence that he chased any slaves fleeing Egypt. Ramesses II's late 13th century BC stela in Beth Shan mentions two conquered peoples who came to "make obeisance to him" in his city of Raameses or Pi-Ramesses but mentions neither the building of the city nor, as some have written, the Israelites or Hapiru. Additionally, the historical Pithom was built in the 7th century BC, during the Saite period. Merneptah (c. 1213–1203 BC): Isaac Asimov in his Guide to the Bible makes a case for him to be the Pharaoh of the Exodus. Setnakhte (c. 1189–1186 BC): Igor P. Lipovsky makes a case for him to be the Pharaoh of the Exodus. Siamun (c. 986–967 BC): is the most commonly proposed candidate for this role. Psusennes II (c. 967–943 BC): the Catholic Encyclopedia sees him as the best candidate. Shoshenq I (c. 943–922 BC): Edward Lipiński dated the destruction of Gezer to the late 10th century rather than earlier, and suggested that its conqueror was Shoshenq I of the 22nd Dynasty. ^ Troy Leiland Sagrillo. 2015. "Shoshenq I and biblical Šîšaq: A philological defense of their traditional equation." In Solomon and Shishak: Current perspectives from archaeology, epigraphy, history and chronology; proceedings of the third BICANE colloquium held at Sidney Sussex College, Cambridge 26–27 March, 2011, edited by Peter J. James, Peter G. van der Veen, and Robert M. Porter. British Archaeological Reports (International Series) 2732. Oxford: Archaeopress. 61–81. ^ Meyers, Stephen C. "IBSS – Biblical Archaeology – Date of the Exodus". www.bibleandscience.com. Institute for Biblical & Scientific Studies. Retrieved 13 April 2017. ^ Stephen L. Caiger, "Archaeological Fact and Fancy," Biblical Archaeologist, (9, 1946). ^ Long, V. Philips; Neils Peter Lemche (2000). Israel's past in present research: essays on ancient Israelite historiography. Eisenbrauns. p. 398. ISBN 978-1-57506-028-6. ^ "The Bible Chronology from Solomon to Hezekiah". nabataea.net. CanBooks. 1935. Retrieved 13 April 2017. ^ Kenneth Kitchen (2003), On the Reliability of the Old Testament. William B. Eerdmans Publishing Company, Grand Rapids and Cambridge. ISBN 0-8028-4960-1, p. 108. ^ Gabriel Oussani (July 1, 1912). "Solomon". The Catholic Encyclopedia. Bennett, Chris (1996). "Temporal Fugues". Journal of Ancient and Medieval Studies XIII. Patterson, Richard D. (2003). "The Divided Monarchy: Sources, Approaches, and Historicity". In Grisanti, Michael A.; Howard, David M. (eds.). Giving the sense: understanding and using Old Testament historical texts. Kregel. ISBN 978-0-8254-2892-0. Rohl, David (1995). A Test of Time. Arrow. ISBN 0-09-941656-5. Shea, W.H. (1996). "Exodus (date of the)". In Bromiley, Geoffrey W. (ed.). The International Standard Bible Encyclopedia:E-J. Eerdmans. ISBN 978-0-8028-3782-0. This page was last edited on 16 April 2019, at 13:55 (UTC).